A cultivar of Camellia japonica L., ‘Paeoniflora rubra’ has Paeony-shaped deep red flowers up to 10cm across, with 10-12 large outer petals in 2 rows, and a large number of smaller, irregular petals in the centre. It is another sport of ‘Pompone’. [ICR]. ‘A vigorous shrub, has a tendency to grow tall, and requires to be pruned to give it a handsome form; leaves two inches wide, and two and eleven lines long, a little dentated, oval, acuminated, shining, of rather a deep green; bud large, rounded, scales green, flower four and a half inches in diameter, and sometimes larger, of a vivid rose, No.4, often of a cherry-red, No.2, full; petals flat in the circumference; in the centre large, and in form of a cornet, numerous, narrow, close, forming an elevated centre. –Superb.’ [Berlèse Monography p.68/1838]. ‘We consider this beautiful variety of the Camellia [Camellia japonica paeonaeflora] to be a most valuable acquisition. […] It was imported about the year 1810 from China [to Kew], by Captain Wellbank.’ [LBC no.238/1818]. Berlèse gives its country of origin as Japan. [Berlèse Monography p.99/1838]. This data seems at odds with its origin as a sport of Pompone given in the ICR. ‘Paeoniflora rosea’ is the name under which either rubra or pallida was frequently sold by Macarthur. Listed in all published catalogues [T.248/1843]. Paeoniflora is listed in both the 1830 and 1836 editions of Loddiges’ Nursery catalogue, copies of which are held at Camden Park [CPA]. In the 1836 edition it is marked with a ‘c’, denoting grown at Camden. Paeoniflora is also marked with a tick and ‘o c’ in an article by ‘G.A.L’ in the Horticultural Register. This denotes new to the colony and grown at Camden. Although this book originally belonged to James Bowman and only later to Macarthur, these markings indicate that it was grown at Camden and was new to the colony. [HR p.634/1832]. Macarthur sold plants to Bailey and Sons of Adelaide in the 1840s and 1850s. A plant was also sent to John Bidwill in Tahiti on 17th August 1844. See also Camellia japonica ‘Paeoniflora Pallida’. 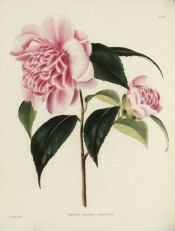 The flower represented here by an image from Loddiges Botanical Cabinet, called Camellia japonica paeonaeflora, is probably the form known by William Macarthur as pallida.